The most comprehensive and detailed guide for the technology, processes and opportunities in the algae-based CO2 industry. Thousands of CO2 emitting power plants and industries face a costly problem - reduce their CO2 emissions or pay penalties. What if these companies and power plants could use algae to absorb the CO2 and generate biofuels in return? This is precisely what companies and power plants around the world are beginning to explore. This comprehensive report will provide you with rich and practical insights and data for you to start quickly working on this domain either as a researcher or as an industry. People who wish to procure the report under this option are requested to send an email to muthukrishnan@eai.in with their details. 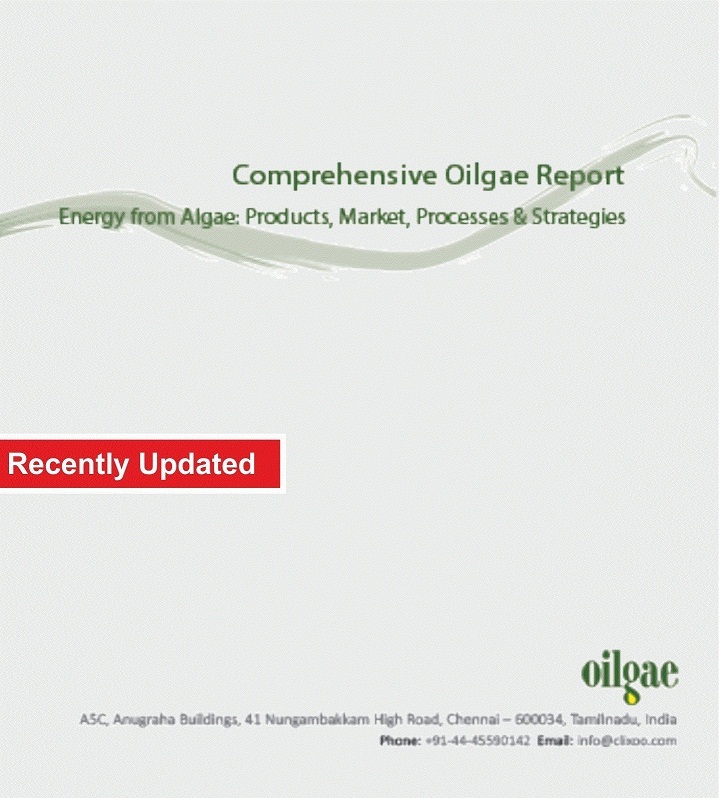 About Oilgae Oilgae is the premier resource for the global algae energy industry. Started in 2006 with a dedicated focus on algae energy, Oilgae today serves as a crucial platform and opinion-leader for this industry. The Oilgae team is frequently interviewed by leading world media and frequently presents at seminars and conferences. Some of the media that Oilgae has been mentioned in are: WorldChanging (Columbia University), BBC, Salon Magazine, Los Angeles Times, New York Times, Wired, India Times and more. Oilgae today is so synonymous with algae energy that many people worldwide use Oilgae as the word to refer to oil from algae! It helps you understand all aspects of the algae energy domain and provides you key insights which will be invaluable in planning your venture. It includes a number of real life case studies to assist the reader in gaining a more practical perspective of the industry status. It has been developed with inputs from authoritative sources. Special emphasis is on inputs that will facilitate businesses to quickly take further steps. Is there a possibility of heavy metal contamination in algae due to their presence in the flue gases? Will NOx present in the flue gas serve as a nutrient, in addition to the CO2? Can we grow macroalgae for power plant CO2 sequestration? What are the major problems faced by companies implementing algae based CO2 sequestration techniques near power plants? Can power plants use waste water from their facilities for growing algae? What are the methods by which flue gas can be cooled before passing it into algae systems? Is it necessary that algae ponds need to be constructed right next to power plants? What is the average area required for the construction of algae ponds for each power plant? Which are the algal species suited for CO2 capture of power plant emissions. The report provides inputs on three major aspects of algae- based carbon-dioxide capture. Concepts of Algae-Based CO2 Capture This section provides information on concepts of algae-based CO2 capture and algae Species suited for CO2 capture of power emissions. Processes & Challenges This section provides information on process for algae cultivation near power plants and challenges of algae-based CO2 capture. Typical coal-fired power plants emit flue gas from their stacks containing up to 13% CO2. It is estimated that power plants produce over 30% of all greenhouse gases worldwide. Of the approximately 30 billion T of CO2 emitted by all human activities together every year, power plants alone emit about 10 billion T of CO2! There are about 50,000 power plants in the world, with 8,000 of them in the US alone! Critical Problem 1 - These thousands of power plants need an effective solution by which they can reduce their net CO2 emissions. Algae, especially microalgae, just love CO2. Each ton of algae produced consumes about 1.8 T of CO2. In fact, for many millions of years, algae have been the largest consumer of CO2 (and largest emitter of oxygen) in the world. It can thus be said that all living beings on earth owe their lives to algae! Current efforts to make biofuels from algae face the problem of finding concentrated sources of CO2 as algae require much higher concentrations of CO2 than are found in the atmosphere. Critical Problem 2 - In order to become an effective feedstock for biofuels, algae require concentrated sources of CO2. Need for an effective CO2 emission reduction mechanism for power + Need for concentrated sources of CO2 for algae biofuels = Co-locating algae cultivation next to power plants provides emissions reduction while resulting in biofuels feedstock. One ton of algae biomass requires about 1.8 T of CO2; this implies that out of 10 billion T of CO2 that the power plants emit, we can get about 5.5 billion T of algae biomass. The right strains of algae have about 30% of oil by weight. Thus, 5.5 billion T of algae will result in about 1.65 billion tons of oil. The total world consumption of oil is about 4.2 billion T of oil every year. Thus, theoretically, algae grown using power plant flue gas have the potential to produce about 40% of our total oil consumption. Owing to the fact that high purity CO2 gas is not required for algae cultivation, flue gas containing CO2 and water can be fed directly to the photobioreactor. Power plants that are powered by natural gas or syngas have virtually no SO2 in the flue gas. The other polluting products such as NOx can be effectively used as nutrients for micro algae. Microalgae culturing yields high value commercial products that could offset the capital and the operation costs of the process, at least to some extent. In addition to biofuels, algae are also as the starting point for high-protein animal feeds, agricultural fertilizers, biopolymers / bioplastics, glycerin and more. The entire process is a renewable cycle. In addition to being a promising future feedstock for biofuels, algae have tremendous potential for other applications, including industrial enzymes, medical therapeutics, and even animal feeds. The algae-based CO2 capture avenue thus provides the companies the opportunity to capture CO2 (and possibly earn carbon credits) while at the same time producing Biofuels. A number of businesses around the world have realized the potential of algae-based CO2 capture and are taking their first steps to explore this exciting avenue. 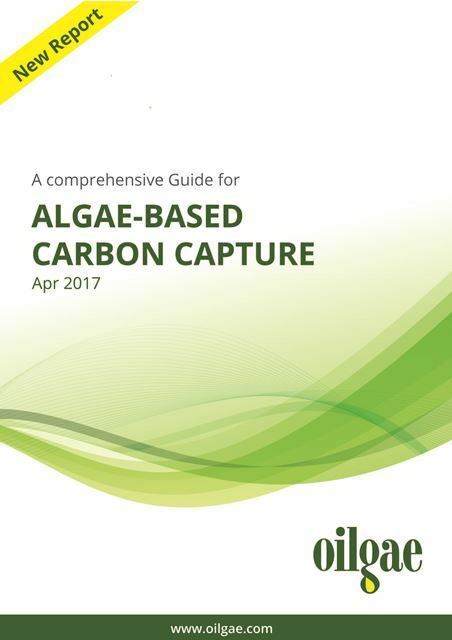 In order to assist industries and companies that are keen on exploring the potential of using algae for CO2 capture, Oilgae has come up with the Oilgae Guide to Algae-based CO2 Capture, a comprehensive report on this topic. The report focuses on the potential of algae-based CO2 capture, and provides critical inputs on current efforts, bottlenecks, costs and challenges facing this vital segment. 1.3 How Are Algae Grown Next to Power Plants Cost Effective? Process for Algae Cultivation near Power Plants. 16.4 Why Isn’t Algal Biodiesel Currently Produced on a Large-scale? 18.6 What’s New in Methane? 20.8 Reference – Will the Future of Refineries be Biorefineries? It answers the most important questions that entrepreneurs, investors and businesses have regarding algae CO2 sequestration. The report focuses on carbon dioxide sequestration opportunities using algae and offers recommendations on needed research and development to bring cost-effective competitive sequestration technologies to the market. The report explains the concept of carbon credits and the added benefits of monetizing the carbon credits resulting in the production of biofuels. 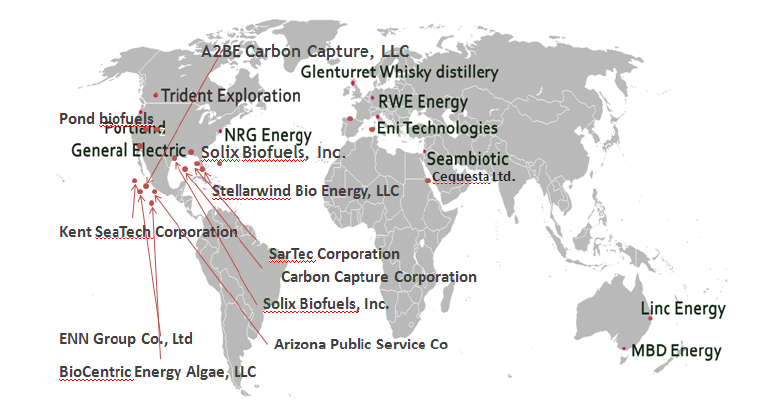 The report provides lists of Venture Capital Firms that had Made Recent Investments in Algae Fuel Ventures and the Companies they have invested in the algae CO2 sequestration domain. It helps you understand the challenges and the possible efforts while using algae for CO2 sequestration. It presents numerous case studies and examples of what the pioneers are doing in the algae CO2 sequestration. It lists companies involved in algae CO2 sequestration and commercial research, enabling students and researchers to get in touch with them for industrial collaborations. It showcases case studies on algae research efforts in the CO2 sequestration at power plants, cement plants, coal burning and natural gas power plants, petrochemicals, Iron & Steel, cements, sugar, tyres, carbon black, mining, aluminium, paper, inorganic chemicals, fertilizers and breweries. The report comprises inputs and updates on pathways and technologies of CO2 sequestration for each industry. It provides extensive details on research efforts and latest developments done by academia and companies in this domain. It provides current and future research areas in algae-based CO2 sequestration domain. "Oilgae is a catalyst for the global algae fuels. As a key component of this catalysis, we are keen on having constant and regular interactions with professionals like you to take this industry further." * People who wish to procure the report under this option are requested to send an email to muthukrishnan@eai.in with their details. Have any Questions in Report / Payment Options? The Comprehensive Report on Attractive Algae Product Opportunities is the only report that provides insights on the wide range of non-fuel applications of algae with both current and future prospects.It will provide entrepreneurs with an idea of how to derive more benefits from their algal energy ventures. A detailed report on all aspects of the algae fuel value chain, the Comprehensive Oilgae Report will be of immense help to those who are on the threshold of investing in algae biofuels.